“UKROP [Ukrainsky Opir and also “dill” in Ukrainian] is Ukrainian resistance. We are raising money for our dear ‘Ukrs,’[a mocking name created by terrorists] who are fighting for the independence of Ukraine. At first this word sounded offensive, but now our boys are proud of being ‘Ukrs,’ young warriors with modern weapons,” said the coordinator of the festival Vira Prokhyra. The charity event is a brainchild of several hundreds of activists who prepared it: journalists, artists, entrepreneurs, teams of HOHOLFEST and Volunteer Hundred, etc. 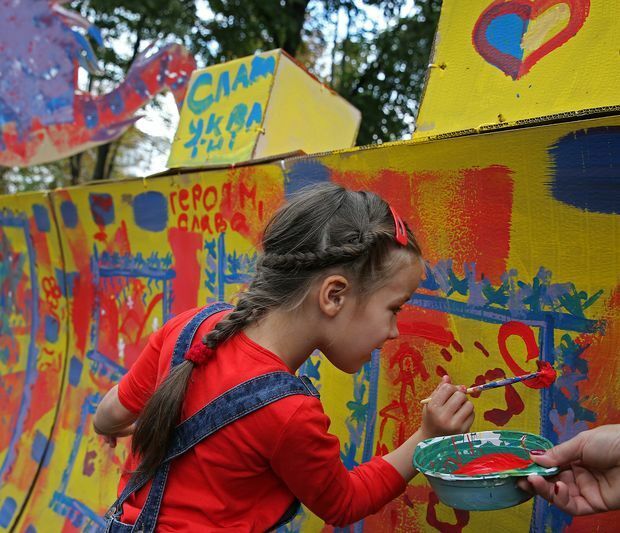 According to Prokhyra, at first several volunteers were planning to hold a small fair in a square near the Kyiv Mohyla Academy. “They wanted students to appear, play the guitar, recite poems, and hoped to raise some money for the ATO warriors. But different people started to join, we united the resources and understood that we could make a big festival,” the coordinator of UKROP said. There were three sources for raising money at the festival: charity fair, volunteer donations, and an auction. Apart from that master classes and Ukrainian language course were held, the cinema in the open air was operating, there were also entertainments for children. Civil debates took place as well, with the participants including political scientist Serhii Taran, journalist Serhii Vysotsky, blogger Serhii Ivanov, and the Head of the Lustration Committee Yehor Soboliev. The participants of the fair donated to the fund of the festival one-third of the money from selling of goods at the least. Master Tetiana Sopina offers chevrons with dill. “Our friend, artist Andrii Yermolenko, created this picture and we embroidered it in chevrons. The dill is now a symbol of pride of being Ukrainian. They mean to offend us with this word, and we are laughing at this. The dill is a strong plant, which will survive at any circumstances. Hopefully, the festival UKROP will be helpful for the guys,” Tetiana Sopina says. A warrior of the Donbas Battalion Fedir, who represents the STOPTERROR Organization, was “on duty” at the event. The volunteer considers, “We need more actions like this, because they unite the nation. It is interesting for me to talk to people here, the citizens ask about the situation in the front and about the needs of the battalion.” Fedir says that because the cold season is approaching, the volunteers need warm things, roll mats, sleeping bags, high-calorie food, and, as usual, armored vests and helmets. The guests of the festival included many people wearing embroidered shirts, clothing with Ukrainian symbols or of blue-and-yellow colors. Designer Olha Navrotska admitted, “Four years ago the combination of blue and yellow seemed awful to me, and now I find it the most beautiful. The more national products we buy, the higher our chances to survive are. The best way to fight the depression caused by bad news is helping our soldiers. There is no way to prove anything to the foes of Ukraine, and trolling hard is just the right thing to do! Yes, I’m an ‘Ukrop,’ a Banderite, a radical nationalist, that’s what we have become under current circumstances.” At the festival the designer presented the T-shirts and cases of her own brand Navro. The adornment of UKROP was the auction that took place on August 31. The most expensive lot was Parajanov’s collage from the private collection of the member of the Volunteer Hundred Olena Masorina, the opening bid of the work was 5,000 dollars. The lots also included jewelry, Ihor Haidai and Yevhenia Hapchynska’s albums, etc. On September 1 the organizers divided the raised money among several military brigades and battalion Donbas. They will publish the report on expenses on the Internet.